Purpose: To practice letters or letter patterns that have multiple sound options. Description: Each item includes a sorter and a game board. In addition some include a poster of the mneumonic used to help student remember sounds. Most games include just one deck of cards, however some have two or more. Game pieces are included. Re-sealable zipper bags, allow for easy storage of materials for each item. 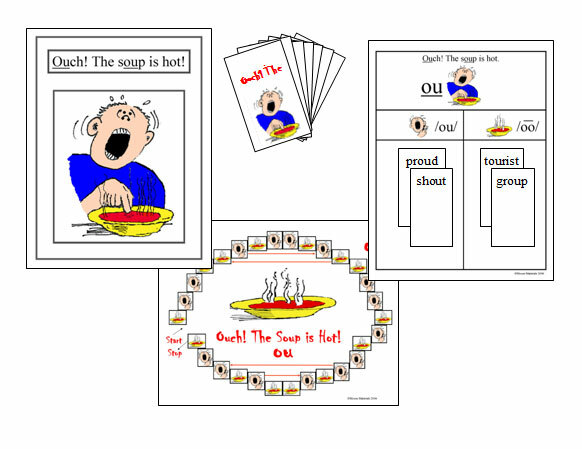 Activities: Students read words and determine the correct sound option. They sort words into piles. Sorters with corresponding mnemonics and key words are provided. In addition, students take turns working their way around game boards specifically designed for each letter combination. These versatile materials can also be used to play exciting games of War and Switch. SW2 Cow in the Snow: 2 sounds of "ow"
SW6 Eat Bread and Steak: 3 sounds of "ea"
SW7 The Penny Hit the Fly: 2 sounds of "y"